1. Even silly store-bought costumes are not as silly as my husband. 2. 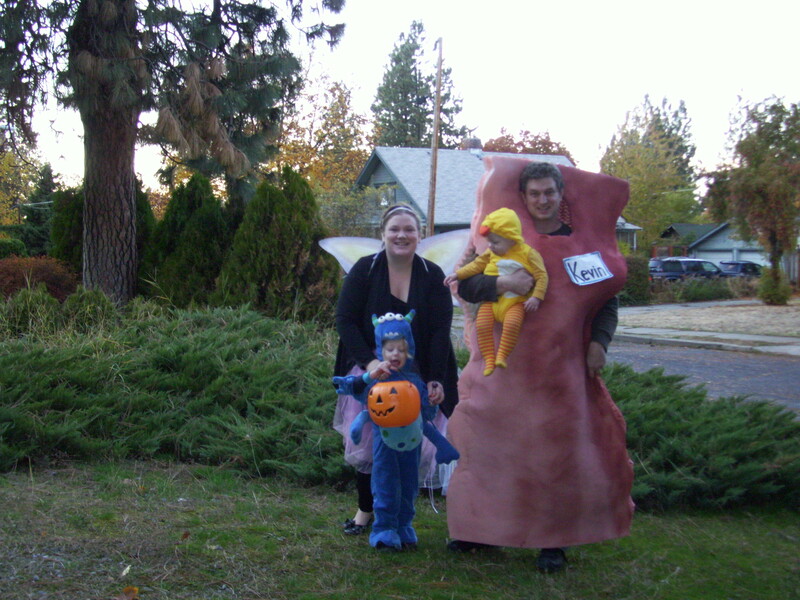 Homemade costumes, especially funny ones, take some construction effort. 3. I would not be frantically trying to make his costume the night before Halloween like last year. So did you get it right away? If not, don’t worry, I won’t judge you. Okay so maybe a little. But not as much as I judged the lady that thought he was sausage. Come on, who dresses up as sausage? Bacon, more specifically, Kevin Bacon is so much better. For the record baby Liam is a duck because the costume came with adorable orange and yellow striped tights, and there are very times in life when it is socially acceptable to put your little boy in tights, so I went with it. Logan is a monster. And yes he is adorable in his cute little costume, that because of his poofy monster belly zips up the back. But not all the way down the back; more like half-way. Which made wrestling a toddler in and out of it to go to the bathroom all night an absolute joy. Clearly this costume was not made by (or apparently purchased by) anyone with a whole lot of brains. Let’s make (or in my case buy) a costume for three-year olds (who are likely to be potty trained just enough to wear big kid undies, not enough to be able to hold it for any amount of time) that’s nearly impossible to get out of. Genius! Seriously not my finest parenting moment. (However, still better than the time that I lost the baby inside my tiny house – that was ridiculous.) Moving on, I am dressed as a lovely fairy princess costume that consisted of a tulle skirt that I made myself, at the price of many hot-glue burns. That’s right I hot glue stuff together when I’m feeling lazy even though I know how to sew. 1. Head to the craft store to purchase foam. 2. Realize craft foam is expensive! I want to make a Halloween costume, not a car payment. 4. Pull child off of said ladder. 5. Leave craft store, and drive across town to other, sometimes cheaper craft store. 6. After arriving at other craft store, stop your toddler from nearly taking down a giant display of glass vases. 7. Locate craft foam and determine that it is only slightly cheaper. 8. Tell your whining toddler that it will be lunch time eventually, but right now it’s 10 in the morning, so it’s going to be awhile. 9. Leave second craft store empty-handed. 10. Tell toddler that it’s still not lunch time. 11. Head to big box store. 12. Tell toddler that no, he may not have a corn dog because it is not time for lunch. 13. Locate craft foam, and realize that all craft foam is appallingly priced. 14. Have epiphany and head to bedding section. 15. Select two large pieces of bedding foam for much cheaper than craft foam. 16. Enjoy your foam locating triumph for a moment. 17. Realize the baby is licking the filthy cart and try to get him to stop. 18. Listen to the baby scream because you wont let him lick the cart. 19. Give up and pretend not to notice the baby licking the cart. 20. Try to decide if “burnt amber” or “rusted sunset” spray paint looks more bacon-ey. 21. Select spray paint and head to the checkout. 22. Finally give in and agree to feed the toddler lunch. 23. Grab lunch and head home. 24. On the way home, realize you forgot velcro. 25. Go back to the store for velcro. 26. Once home, put kids down for nap, and wish that you had wine in the house. 27. Have an intense marital squabble about the proper way to paint foam. 28. Equate husband doing the painting his way with him not loving you. 30. Run out of spray paint. 32. Convince husband to do it your way. 33. Gloat about how much better your way works. 34. Realize that although the painting was done on the back porch, the whole house reeks of spray paint. 35. Once paint is dry cut out your bacon shapes. 36. Velcro your bacon shapes together to make a bacon suit. 37. Run out of velcro. 38. Go purchase additional velcro. 40. Have husband make a “my name is: Kevin” nametag. 41. Tell him his printing isn’t good enough, and make your own nametag. 42. Attach nametag to bacon suit. 43. Put on bacon suit. 44. Win costume contest at work, and delight many people on the street. 45. After Halloween, eat lots of your kids candy. You deserve it. So this may seem like a lot of work for a Halloween costume, but it delighted so many people. Although one gal thought he was a colon, most adults got it, and laughed at the pun, and kids giggled and exclaimed, “Hey! He’s bacon!” It was a seriously excellent Halloween costume. And while it is sad to put so much work into something that is only worn for one day, I’m glad we did it. And next year, I suppose he could reuse the costume and be Kevin Colon.